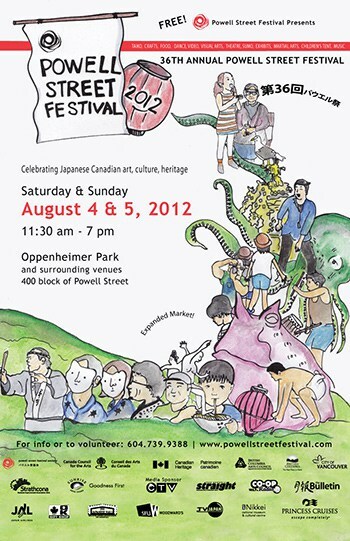 The Powell Street Festival is the largest Japanese Canadian festival in the country and the longest running community arts celebration in Vancouver! Enjoy traditional and contemporary Japanese Canadian performances and demonstrations, including taiko drumming, sumo wrestling, martial arts, bonsai and ikebana, folk and modern dance, alternative pop/rock/urban music, visual arts, film/video, as well as historical walking tours, tea ceremonies, and a fantastic array of Japanese food, crafts, & displays. See below for info about past Festivals. View our full print Festival program here!! Download our PDF two day Festival schedule here! Download the entire 2017 Festival Program Guide (PDF, 9MB) or just the Festival 2017 Schedule (PDF, 1MB) to see all of the activities, times, and locations. This 2017 extravaganza included a new interactive installation entitled “Macro Maki”, a special presentation on Japan’s Third Gender, a panel with two of Haruki Murakami’s top translators, and a performance by the dynamic duo George and Noriko – a Japanese blues cowboy and Tsugaru samisen player from Melbourne, Australia. Powell Street Festival, Canada’s largest festival of Japanese arts and culture, celebrates 40 years with a weekend full of live performances, martial arts, beautiful crafts, and delicious Japanese food! This year’s festival promises to be one of our biggest and best to date. Attendees will discover an interactive section in the park, a street party on Alexander Street, and all the beloved hallmarks of this unique event. The eclectic lineup of performers included Australian koto virtuoso Miyama McQueen-Tokita, Tutchone-Japanese Tlinget-Scottish folk singer Diyet, and the premiere of Chordophone, the violalooping electronica brainchild of brothers Marcus and James Takizawa. View our online 2015 Festival Schedule. Download the 2015 Festival Program Guide (PDF, 12.5 MB) or just the the 2015 Festival Schedule (PDF, 1.7 MB). Powell Street Festival, Canada’s largest festival of Japanese arts and culture, celebrates its 39th year with a weekend jam-packed with live performances, martial arts, beautiful crafts, and delicious Japanese food! In 2015, we were thrilled to present a diverse extravaganza that juggles the traditional and cutting edge: in addition to Festival staples like Sumo Fun Club, Omikoshi, Tanko Bushi, Sakura Singers, and a wide array of martial arts, we were pleased to present Cuban inspired pianist Niho Takase; monster jazz drummer Bernie Arai; avant-garde muse Rachel Kiyo Iwaasa; Calgary-based movement artist Mark Ikeda; Butoh-inspired sensation Kokoro Dance; comedy troupe Assaulted Fish; and our mega-taiko event, Against The Current, featuring the combined forces of Katari Taiko, Sawagi Taiko, Sansho Daiko, and Chibi Taiko. Powell Street Festival also hosted a number of events that explored the rich and complex history of the many communities who have called the Downtown Eastside home: in addition to our Powell Street Historical Walking Tours, given throughout the weekend by Nikkei National Museum, we were proud to present Labour Landscapes: A Storytelling Walk, which explored the multicultural labour history of the DTES; and Nikkei Stories of Powell Street: a film/new media project that brings to life the historical Japanese Canadian presence in the Powell Street area. Alexander Street (between Princess and Dunlevy Avenues) and Jackson Avenue (between Railway and Cordova Streets). 37th Annual Powell Street Festival! Download the 2013 programme (4.8 MB). PSF celebrated artistic champions who have risen above an array of challenges in order to create dynamic works and build stronger communities. This included Mitch Miyagawa’s film A Sorry State, which investigates the impact of the state apology on individuals who have borne the brunt of Canada’s colonial and racist past; a new work by taiko drummer Tiffany Tamaribuchi (USA) for Canada’s trailblazing taiko ensemble Katari Taiko (BC); and a stirring debut performance of the butoh-flavoured Pond by dance artist Tomomi Morimoto (QC). Yamantaka // Sonic Titan are a psychedelic noh-wave opera group fusing noise, metal, pop and folk music into a multidisciplinary hyper-orientalist cesspool of East-meets-West culture clash in giant monochrome paper sets. Founded in late 2007 by performance artists Alaska B and Ruby Kato Attwood, YT // ST is an Asian, Indigenous and Diasporic Art Collective that was shortlisted for the 2012 Polaris Prize. Presented in partnership with Queer Arts Festival. A story of forbidden love, divided loyal- ties and culture clash unfolds in When the Sun Comes Out. This lesbian opera explores the oppression that queers face and the risks they take, in nations where homosexuality is illegal. Written by composer Leslie Uyeda and poet Rachel Rose. Directed by James Fagan Tait. Featuring Teiya Kasahara, Julia Morgan and Aaron Durand. Commissioned by the Queer Arts Festival and co-presented by the Powell Street Festival. 36th Annual Powell Street Festival! Download full 2012 Festival programme. In 2012, it had been thirty six years since the inaugural Powell Street Festival, and in that time we’d grown from a small community event to a full-blown arts & culture celebration attended by thousands each year. We are grateful to all the participants, volunteers, funders, attendees, and our DTES community for supporting our efforts these past number of years! Download the Programme (PDF, 2.7MB) and Schedule (PDF, 1MB) as printed in The Bulletin. Download the schedule (1.1 MB) and the full programme (3.8 MB) as printed in The Bulletin. The Powell Street Festival headed home in 2010! After a one-year relocation in 2009 to Woodland Park, the Powell Street Festival returned to its traditional home in the newly-renovated Oppenheimer Park. Taking inspiration from the Japanese notion of Koen debut, or Park debut, whereupon neighbourhood toddlers are introduced to their local community, the 34th Annual Powell Street Festival celebrates the idea of neighbourhood, youth, children, the park and its landscape. Returning to its traditional home in Oppenheimer Park after a one-year relocation, Powell Street Festival Society (PSFS) celebrated its return and its 34th year with the theme of Park/Koen. As important places of congregation and community, Oppenheimer Park is a source of escape, celebration and rejuvenation. Heralding the city-directed and community-based renovation of Oppenheimer Park, PSFS looks back to its grassroots origins and to its future as a community-based organization and presenter of challenging experimental arts. Like Oppenheimer Park where nature meets cultivation, PSFS’ 34th year celebrated the confluence between the wilder side of artistic expression as well as the more refined traditional forms of art. Oppenheimer Park is inseparable from the organization’s 1977 birth. It is the locus of the formerly-named Powell Grounds, and is the centre of Vancouver’s early 20th century Japanese Canadian community, once a busy gathering site for baseball games and big community gatherings. 2010 aimed to re-entrench the stable roots of the past and build strong local connections, reflecting on this newly seeded and reborn environment. Taking inspiration from the Japanese notion of Koen debut, or Park debut, whereupon neighbourhood toddlers are introduced to their local community, PSFS will focus particularly on the idea of neighbourhood, youth, children, the park and its landscape itself. The season’s many shades of Park themed events began with the artistic collaboration between Andrea Nann and Maiko Bae Yamamoto who performed a new interdisciplinary work set in the historic Vancouver Japanese Language School (located nearby the Park), a new series of youth-directed and community-based theatrical PodPlays set in the Oppenheimer area by NeWorld Theatre, performances by local bluegrass band Shout!WhiteDragon, and the experimental performance and public interactive exchange by Tochka Factory. This series of events in 2010 brought in new artists and created many opportunities for creative collaborations. Download the 2009 Festival schedule (pdf) by clicking here. To download a pdf of the entire program, click here. The Powell Street Festival had free bicycle parking in 2009! The Bicycle Valet service is a free, safe and secure solution for event goers. It allows attendees to store all non-motorized transportation while they enjoy an event without the worry of where they lock or store their bike. It’s quite simple. Patrons sign a claim check, give us their bike and keep the stub. When they want to leave, they bring back the stub and their bike/belongings are returned. For more info go to www.thebicyclevalet.com. 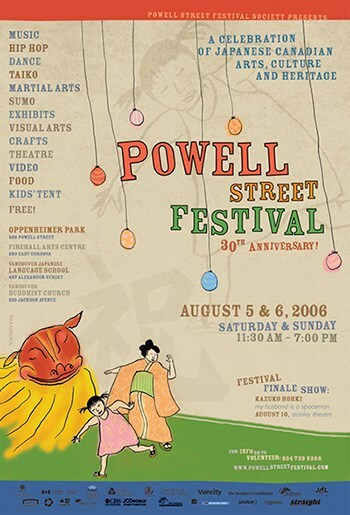 In 2009, the Powell Street Festival explores the concept of Migration as it is expressed within Japanese Canadian identity. For the 33rd festival, the theme of Migration is negotiated on both the macro and micro levels. Allowing for the expression of the Japanese Canadian cross-cultural migratory experience and the fusion that has resulted, Migration also explores intergenerational and interdisciplinary exchange. It presents a temporal and spatial migration back to Japanese hereditary traditions as well as the exploration of contemporary media, technology, arts and cultures, and the new trajectories that they provide. Cultural change is so often a result of migration—people adapting to foreign lands and communities. Although the migratory experience can heighten the hold on hereditary traditions, culture itself is by no means static; it is in a constant state of evolution. However, the speed of cultural evolution has been compounded by the rise of globalization and the subsequent decay of geographical barriers. People, ideas, and cultural expressions have greater mobility. The resulting exchanges have born forth fusions of seemingly disparate cultures. In ancient times, Japan borrowed many things from their neighbour China, including written language, pottery, martial arts, and religion. However, in the contemporary era, Japan has extended its absorption of culture beyond Asian borders. Renowned for their contemporary anime and manga, the Japanese have borne this distinctive aesthetic by fusing Japanese style with Western animation and comics that traversed the waters post WWII. Whereas some of these cultural elements are now perceived as distinctly Japanese, the Powell Street Festival redefines these ideas of the traditional and the contemporary. Bridging a multiplicity of cultures, the Powell Street Festival demarcates a fusion territory of hybrid Japanese Canadian identity. Sensu: An all-encompassing, modern Japanese word meaning “style,” derived from the English word “sense.” Also literally translated as traditional Japanese fan, a symbol of Japanese functional art. Design is a process of relating. Whether to our time, our place, or each other, every moment of relating is an opportunity for interaction and with interaction, an opportunity for design. By attempting to describe how we live while defining our limitations, design allows us to form our ideas so that they may meet in a level field and be sculpted by those at play. Design from Japan is refined. A limitation of resources combined with an ongoing dialog between the tradition of craft and the chaos of play has created recognizable artefacts from centuries past to the present day. It is both a reaction to the world which has formed it as well as an exemplary method for living in that world. Sensu explored how on one side of the field stand the history, tradition, and limitations that have formed our past; and on the other side, stands the contemporary reaction to a modern climate of technology and excess. Where the two interact, stands opportunity. A focus on visual arts, media arts and performances that interact with other media were explored and shown in Sensu. Download the 2007 Festival schedule (pdf) by clicking here. Some highlights of the 31st annual Powell Street Festival included: new work by festival favourites Kokoro Dance; Theatre performance of Skim, written and directed by Mariko Tamaki (Toronto) and performed by Julie Tamiko Manning (Montreal); Visual Arts group exhibit, Between what’s said and unsaid group exhibit, featuring artists from Canada, USA and Japan; public sculpture exhibition by 3rd generation Nikkei artist Michael Tora Speier entitled Broken Only at Sky: a Magnification of 20th Century Japanese Diaspora & Community Journey; music performances by Yuji Nakajima, Keiko Devaux, and special guest from Japan Koichi Makigami; the usual exciting array of taiko by Katari Taiko, Sawagi Taiko, Chibi Taiko, Yuaikai Ryukyu Taiko, and new to this year, Jodaiko, a superstar group led by taiko master from California Tiffany Tamaribuchi; and the annual YUGO Hip Hop Fusion event. We are also presented, for the first time, a Japanese film festival Kibatsu Cinema in partnership with the Pacific Cinematheque, as a lead-up event to festival weekend. The 2007 Powell Street Festival’s theme was Play, a celebration of artistic creativity and possibilities and an exciting and inspirational follow-up to 2006, the Powell Street Festival’s 30th anniversary year that focused more on history and community. Programming explored all facets of this concept from play as recreation or amusement, such as children’s play, to an aesthetic tradition of play that is grounded in an intent toward artistic discovery. The tie that binds various forms of play was a commitment to curiosity and creativity. Artistic process, innovative forms of audience development and engagement, providing more space for children’s and youth events, and integrating children and youth into adult-dominated areas of the festival was prioritized. Since its culturally reclaiming inception, Powell Street Festival has continued to flourish as a veritable hothouse of dialogues, social inquiries, remembered traditions, artistic fusions and urban contrasts. New and old stories and experiences span generations and have come together here for more than three decades. It is a place of not ideal, but real, community activity, creative invention and intervention, social investigation and rediscovered history. PSF has always been committed to openly creative processes that leave room for further exploration and larger definitions of us as (hyphenated) Canadians. Download the 2006 Festival schedule (pdf) by clicking here. Out of town artists included Kyo Maclear (Ontario, literary), Terry Watada (Ontario, theatre), Derek Nishikawa (Ontario, music), Miki Nishida (Quebec, dance), Linda Turnbull (Alberta, dance), Mu Daiko (USA, music), Yamini Nayer (USA, media arts), Yasue Maetake (USA, media arts), Christian Nguyen (USA, media arts), Maria Dumlao (USA, media arts), Kazuko Hohki (Japan, performance) and Angharrad Davies (England, music). Local artists included Hiromi Goto, Roy Miki, Assaulted Fish, Dharmakasa, Sawagi Taiko, Katari Taiko, Baco Ohama, Rafael Tsuchida, Maya Ersan, Karin Lee, Aretha Aoki, Katherine Shozawa, LOUD, World Tea Party, Kokoro Dance and more. Download the 2005 Festival schedule (PDF). Out of town artists included Kim Moritsugu (Ontario, literary), Gerry Shikatani (Ontario, literary), Mariko Tanabe (Quebec, dance), Aya Takada (Japan, visual arts), Yuki Iwata (Japan, media arts), Tadasu Takamine (Japan, media arts) and musicians Nobukazu Takemura (Kyoto, Japan) and Suppamicropanchop (Tokyo, Japan). Local artists included Fred Wah, Hiromi Goto, Henry Tsang, Kirsten Forkert, Kokoro Dance, Theatre Replacement, Hiro and Maiko, Craig Takeuchi, Katari Taiko, LOUD, Alcvin Ramos, Assaulted Fish, Vancouver Opera, Rafael Tsuchida, Vanessa Kwan, and more.